Product #45813 | SKU A-52CUS-II | 0.0 (no ratings yet) Thanks for your rating! This Hoya 52mm HMC Close-Up Filter Set II offers the ability to achieve macro-like results with camera lenses that have 52mm front filter threads. A close-up filter is a magnifier that optically decreases the focal length of a camera lens placed behind it. This effect lessens the minimum focus distance between the camera lens and a subject. Magnification can then be obtained by decreasing the distance between the subject and the combined camera lens and close-up filter. The magnifying power of a close-up filter is indicated by its dioptre strength. A close-up filter with a higher dioptre number provides more relative magnification and can be combined with other close-up filters to increase, or fine-tune the macro effect. These close-up filters have dioptre strengths of +1, +2, and +4. 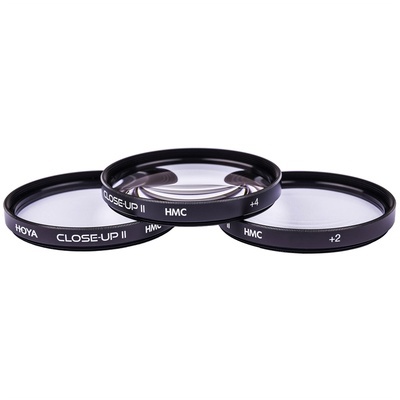 Each surface of the filters in this Hoya HMC Close-Up Filter Set II is constructed from optical glass which includes three layers of anti-reflection coatings that offer improved clarity as well as more effective prevention of internal ghosting and reflections. These close-up filters each provide approximately 97% average light transmission and feature an aluminium-alloy filter ring for durability while remaining lightweight.